A friend of mine suggested to start a special (photo)thread about our seniors and I AM ALL FOR IT ! 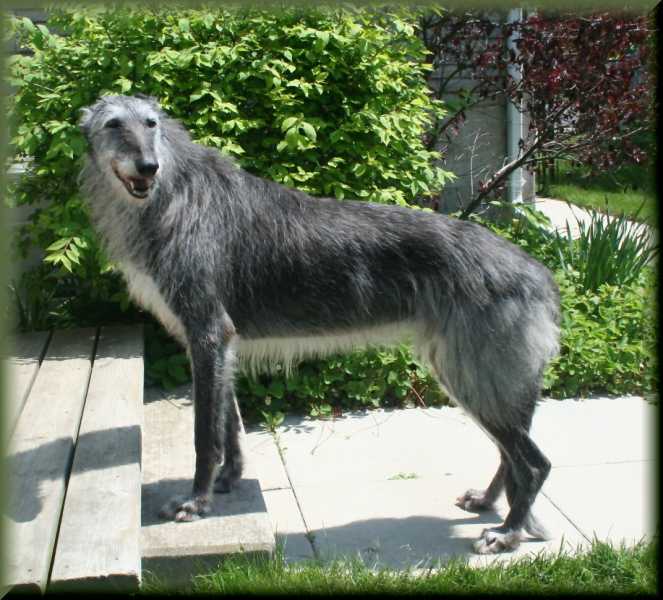 Yes , I love those cute ,cuddly ,clumsy pups , but , oh my , my heart fully opens and I just melt when I meet a senior deerhound . 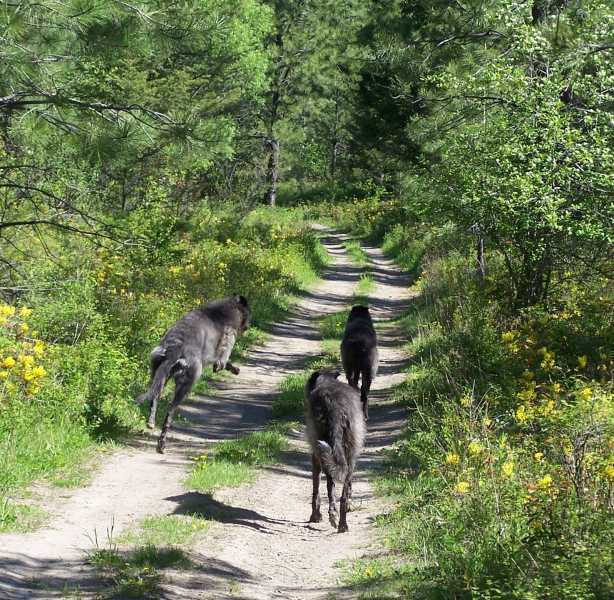 Lucky as I am , I currently live with 3 of them (+ young Hermione )- I can not believe how much I love them and am all over in awe of the senior deerhounds . It is so wonderful how they stay so youthful and how much they keep changing physically every year , manes becoming ever more impressive , eyes becoming ever more expressive and touching , what huge treasures and enrichment they are in our lifes . 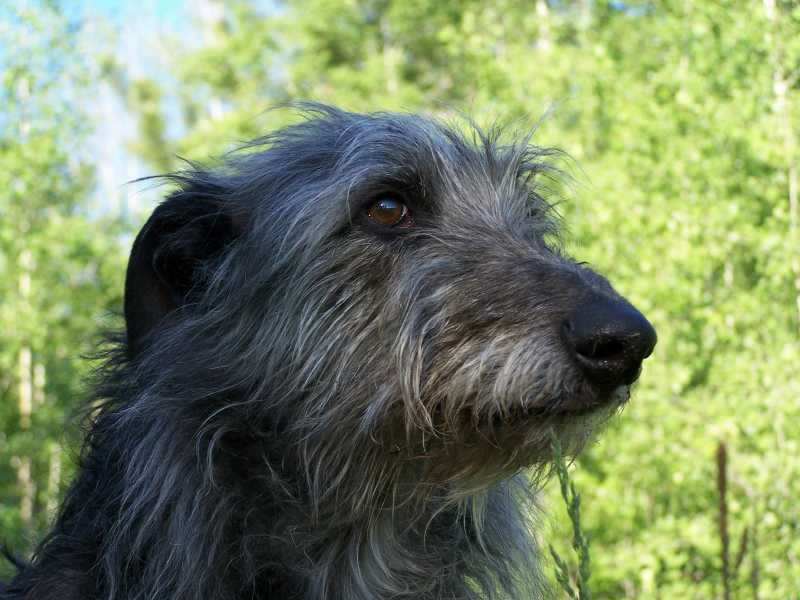 Before I 'll be all teary eyed I will just start by posting a few pics in honour of my current - and past - seniors - none of them " ancient " as I haven't been long enough in the breed , still, wise old/aging hounds they are. First we do have Mawu ( to the left , will be a senior soon ) and then Na'lee on the right ( she is going onto 9.5 years ) - they were posing so nicely the other day , having been friends all their lifes.Mawu still the most determined huntress and , when running in the distance with young Hermione I often can not determine who is who , both so playful ,fast and agile and fun. Last Edit: 7 years 10 months ago by verenav. The following user(s) said Thank You: Elise, Robb, Sid, Clunie, daisymay, truman , Joke_Jan, Joerg Yoki and 2 other people also said thanks. And here comes my 3rd and also younger senior (Chapeltower) Disa , 7years - just having come back from a nice coyote chase and so intensely staring and listening , ready to right away go again and looking all "racy ". 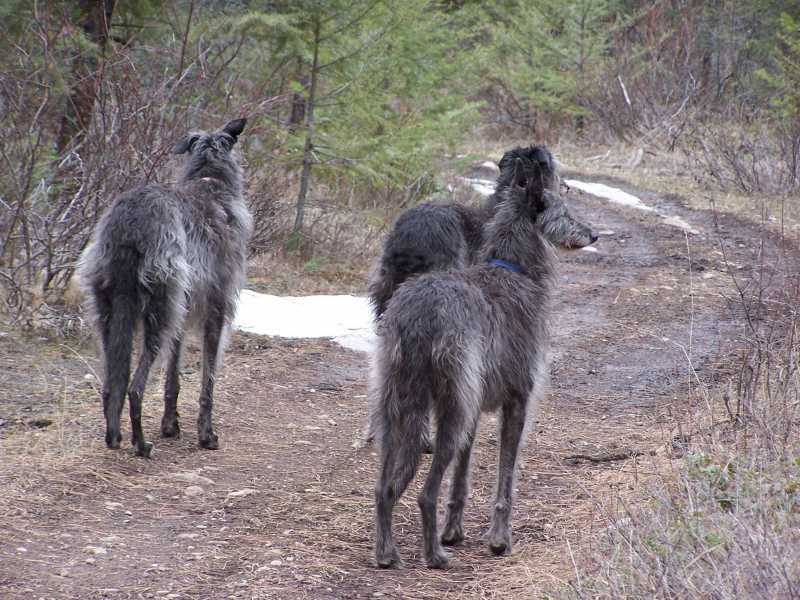 Next pic shows my 3 oldies cornering Hermione( center , 3years ) and just "playing her to death ", yep , oldies still have it ....and then the 3 gals alerting to wildlife and showing very impressive " ear stunts" , shortly before taking off into the bush . 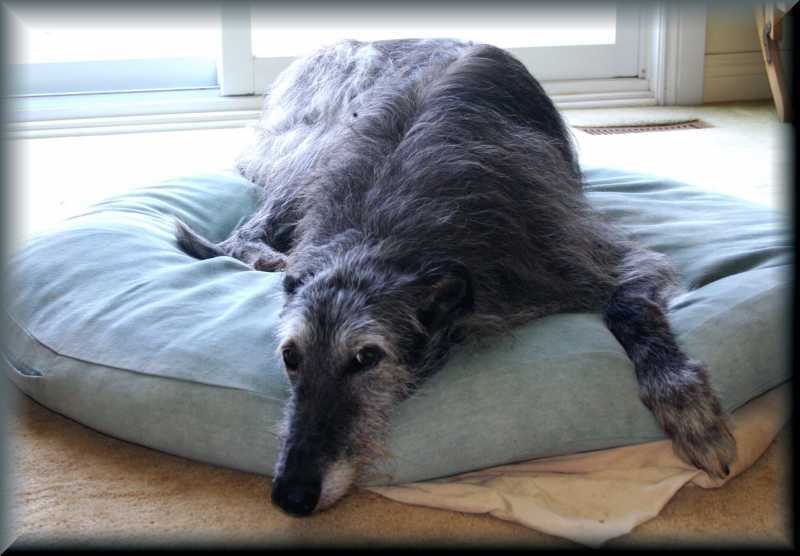 Thanks Verena for open this thread, your warm words and for post of the very nice pictures from your senior Deerhounds. 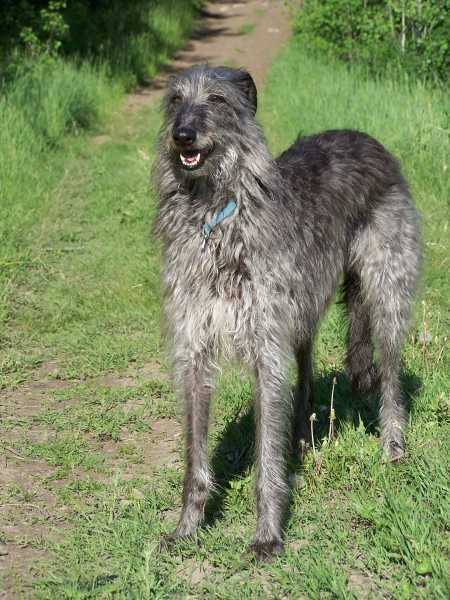 Thanks Joerg , I really hope that lots of pics of grand old deerhounds make it on to this thread ! They are just wonderful - I think , I have another one , belonging to a friend , will try and find her pics , she is about 11 on them . 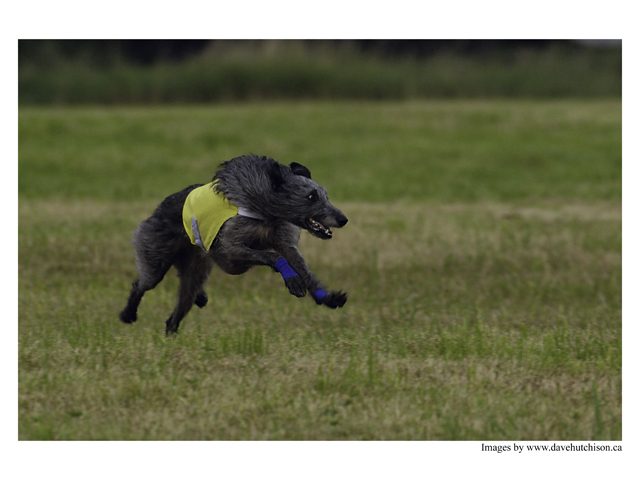 Thanks Verena - what brilliant photos and great dogs. Here's further senior photo this time in Fife Scotland of Jamie (Cusidh Grain). 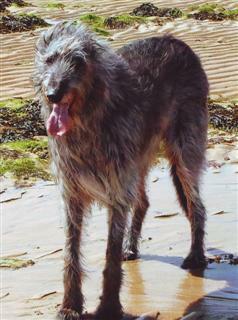 He was 10 years old then and always enjoyed his trips to the seaside. He is gorgeous ! And , isn't it surprising just how big and long their tongues are ? 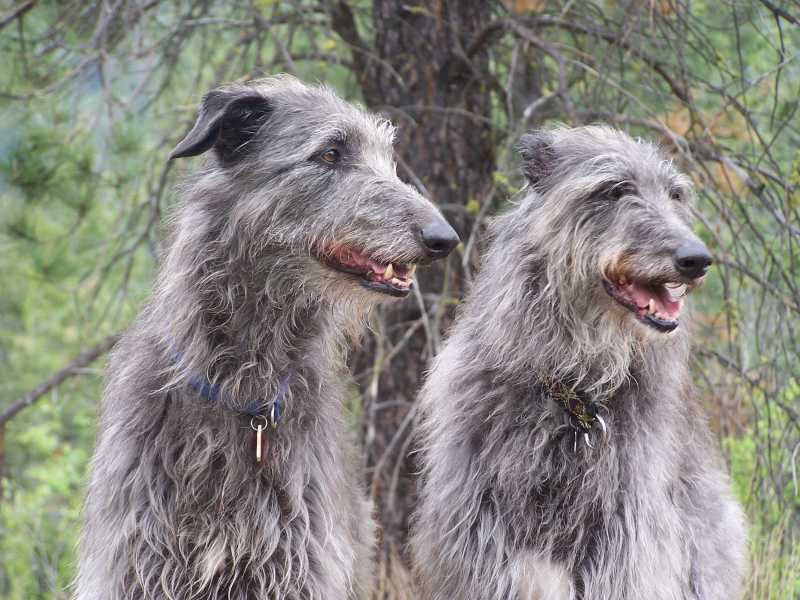 Love these senior deerhounds! 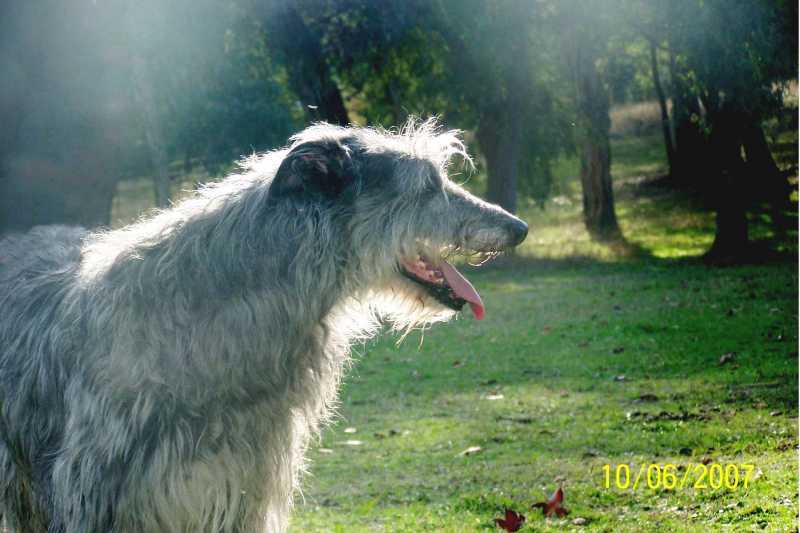 Here's my favourite of my dear Stalker (Dianras Path to Karma) taken on his 8th birthday. before it gave out. Sweet boy. 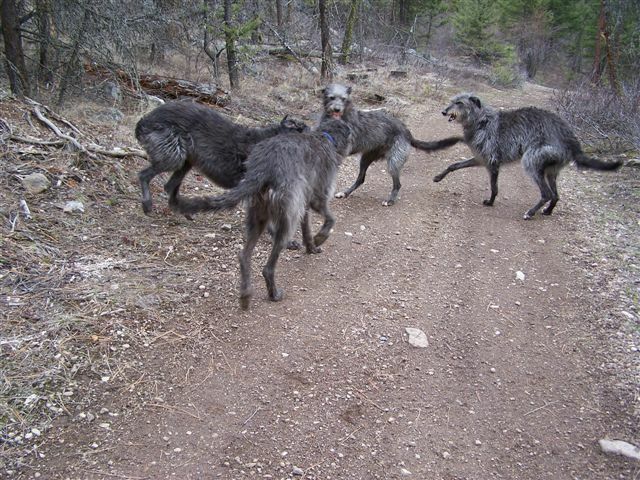 Thanks for post the very nice pictures of the Senior Deerhounds. I enjoy the look of this pics. 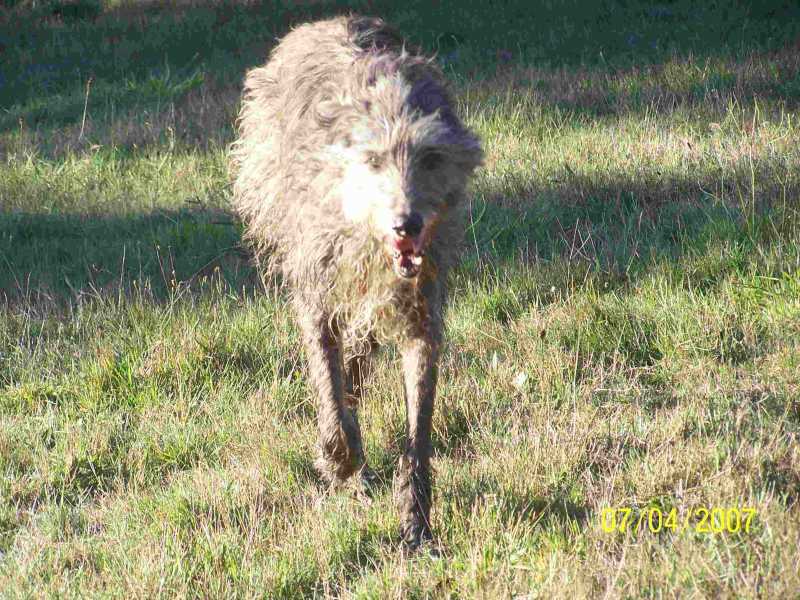 I would be interested in the oldest deerhound we have had? I knew of one that was eleven, any older?? They are so lovely when they are old. This is a pic of Gr. Ch. Jacobite Ragamuffin ( Rags ) just before her 12th birthday. She died just after her 12th birthday ( actually PTS ) after having been fit and healthy right up til then. Never had to go to the vet for any illness til the last. Another pic of Rags, a "bit" of a scruffy article this time...... she LOVED her runs off-lead right up to a week or so before the end. Yes, she did slow down, but not very much. Such great photographs of senior hounds. It is good to see them as well as the puppies. 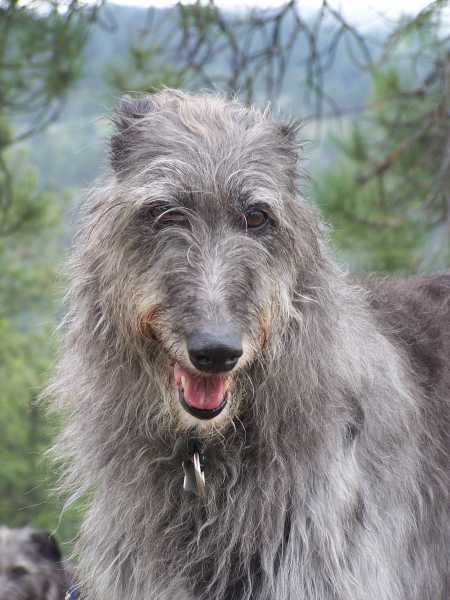 This is our girl Tara (Stainlonan Crumlin Among Arrachogaidh) on her 8th Birthday on 8th May this year. 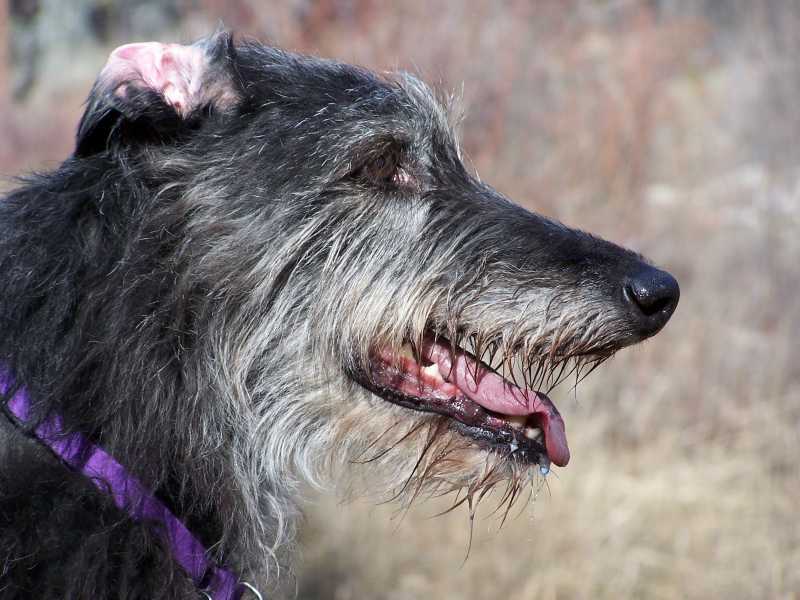 Thanks all for the very nice pics of the senior Deerhounds. Old dogs are wonderfully. 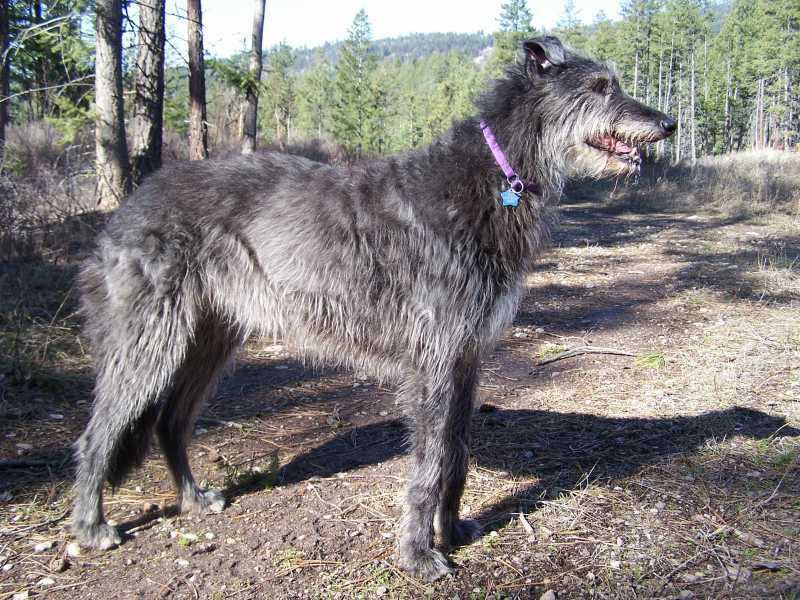 Our oldest dog (not a Deerhound) was 14 years old. Killoeter Ellie is the great grandmother from Yoki's new sister. Today we celebrated the 13th birthday of Nancy and Bill Logan's Ch. Pennants Ghost (Ch. Fernhill's Turbulent Indigo X Ch. Fernhill's Encore). 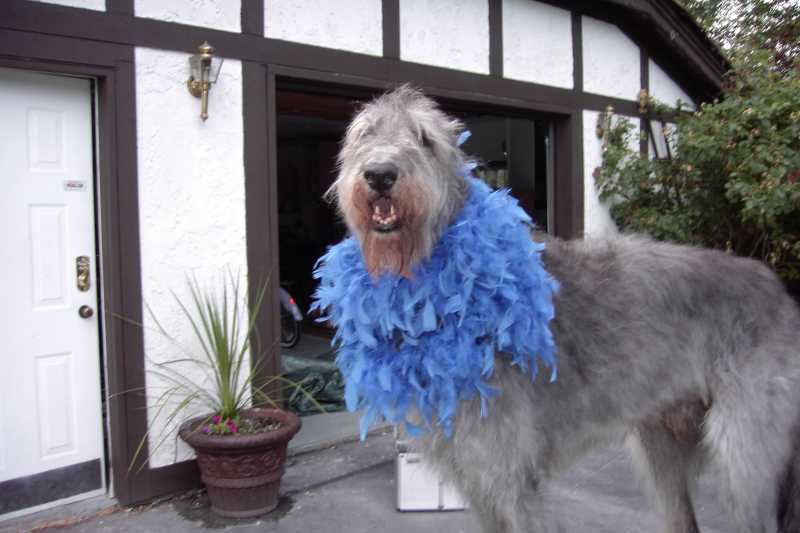 The silver haired Grand Dame provided the usual Deerhound response to her admiring crowd, the hundred pipers piping, the banners waving and celebratory fireworks....she woke up long enough to greet the guests, go for a walk, enjoy the birthday gifts...best was the goat milk cheddar cheese and cookies... then she went back to asleep. She ignored the Probiotics for geriatrics which was my thoughtful gift, and I was a wee bit embarrassed about this offering as she didn't look as if she needed any and clearly has a cast iron constitution. She is quite wonderful, still walks a mile or so daily taken as three sometimes four separate walks. While she is slowing down as she has thrived on 3+ miles daily until hitting the double digit age, she still gets up and down unassisted and loves her meals! Enjoy photos of this new "teenager"..
Last Edit: 7 years 10 months ago by Richard. This is Ghost enjoying her cheddar cheese treats.